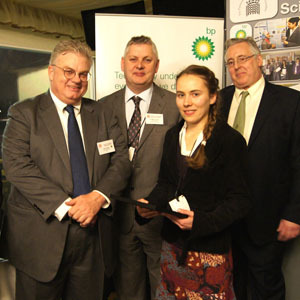 Joanna Brunker, a PhD student in the UCL Department of Medical Physics and Bioengineering, struck Gold at a competition in the House of Commons, for the excellence of her Biology research, walking away with a £3,000 prize yesterday. Joanna presented her research on a new technique to study blood flow in tumours to dozens of politicians and a panel of expert judges, as part of the poster competition SET for Britain, on Monday 18 March. Her research, developing a new imaging technique called 'acoustic-resolution photoacoustic Doppler flowmetry' which can provide new insights into the behaviour of tumours, was judged against 59 other shortlisted researchers' work and came out on top. Joanna said, "I am delighted that my research was so well received. Winning this medal makes me all the more determined to continue with my research so that I can make a difference to our understanding and treatment of tumours." Joanna is planning to spend some of her prize money on presents for her Supervisor, her Head of Department, family and friends, who she says that she couldn't have achieved this success without. Two other UCL PhD candidates were shortlisted from hundreds of applicants to appear in Parliament. Sundeep Teki (UCL Institute of Neurology) and Atif Elahi (UCL Chemistry). Sundeep presented his poster on new approaches for understanding how the brain solves the "cocktail party problem", being able to focus our auditory attention on one particular conversation and filter out background noise. Atif presented a poster on the discovery of a new property of flames. SET for Britain aims to help politicians understand more about the UK's thriving science and engineering base and rewards some of the strongest scientific and engineering research being undertaken in the UK.